Awesome Friday! 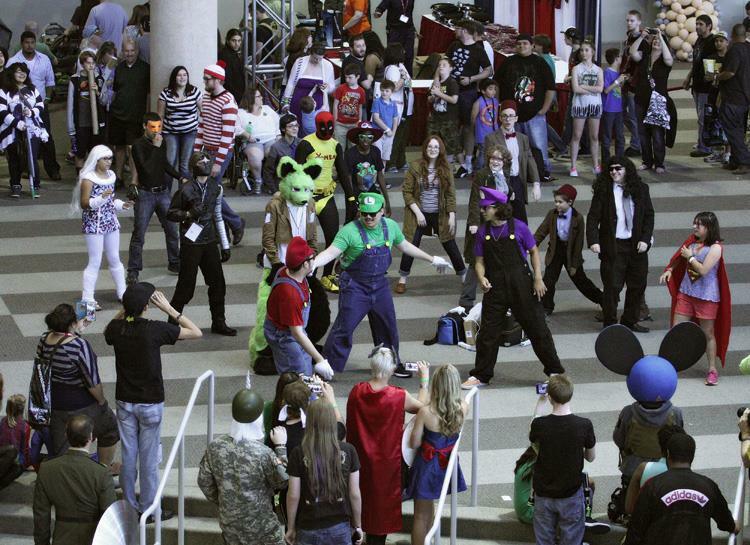 » Blog Archive My First Comic Convention - Dallas Fan Expo 2014 - Awesome Friday! Calling itself ‘Fan Expo Dallas’ and ‘Comic Con Dallas’ simultaneously, this was an event for people like me what like comics and Star Trek and (for seemingly no reason whatsoever) Alice Cooper. My boyfriend bought us tickets for Sunday, luring me in with the promise of William Shatner. I became excited. Consulted the Internet, noticed the unusually high number of TNG cast members on the billing. I became more excited. I was going to be close enough to touch Shatner’s basson, I could see Geordi La Forge in the flesh, maybe he’d even even have a go on his visor! All this for the princely sum of 30 bucks, bargain or what? We dressed up for the occasion. A pair of eager but tentative nerds dipping our toes into the murky waters of cosplay. He wore all black and labeled himself a ‘Rogue Jedi’, I wore Slytherin robes with my gold Adidas hi-tops and called myself ‘Generic Slytherin Girl’. I chewed gum, rolled my eyes and looked bored. I invented a backstory about mitching off potions to go smoking around the back of the herbology class. My Rogue Jedi lamented about his light saber not working properly. Our get ups were far too thick for the glaring Texas heat. We were ready to do this. Once inside the (blissfully air conditioned) convention centre, it became clear that we’d essentially paid money to go to a weird specialist mall and fancy dress contest. The main hall was filled with comic stands piled sky high and a special kind of t-shirt heaven which I imagine would be most appreciated by software developers. Every quirky kink catered for. Every pun immortalized on fabric. Every over priced edition of something spectacularly niche sat under one roof. I agonized over buying a Star Trek onesie and then decided against it. Not enough room in my luggage. It’s a decision that I’ll regret for some time. When we signed in, the organizers kindly gave us a bizarre leaflet that was borderline indecipherable. It featured a map that seemed to have been colour coded almost completely at random. Arrows pointed to nowhere, and almost nothing was labeled. The back page had a tiny bit about the talks and events in a gross small font. We squinted at it and for reasons that remain unclear, we decided we wanted to see Alice Cooper do a talk about something. We consulted the ‘map’ and concluded that he was probably in the blue bit. We couldn’t find the blue bit. We walked around in circles opening doors to the same room again and again. Around every corner we’d open a door expectantly, and behind every door was the judging of the children’s costume contest. It was like being in Spinal Tap. Exhausted I lay down on the floor and sighed. I threw a small tantrum and wondered if I’d ever be happy again. Mercifully the Jedi and I are still at the stage at the stage in our relationship where this was adorable and not extremely irritating. He gently coaxed me up, promising Star Trek, I tutted and gave in. Eventually we found Alice, (don’t ask me how) and he whined on about God and golf and a snake that crapped on him, whilst a man in an Elvis jumpsuit asked him increasingly weird questions about mormonism. We left quick sharpish. 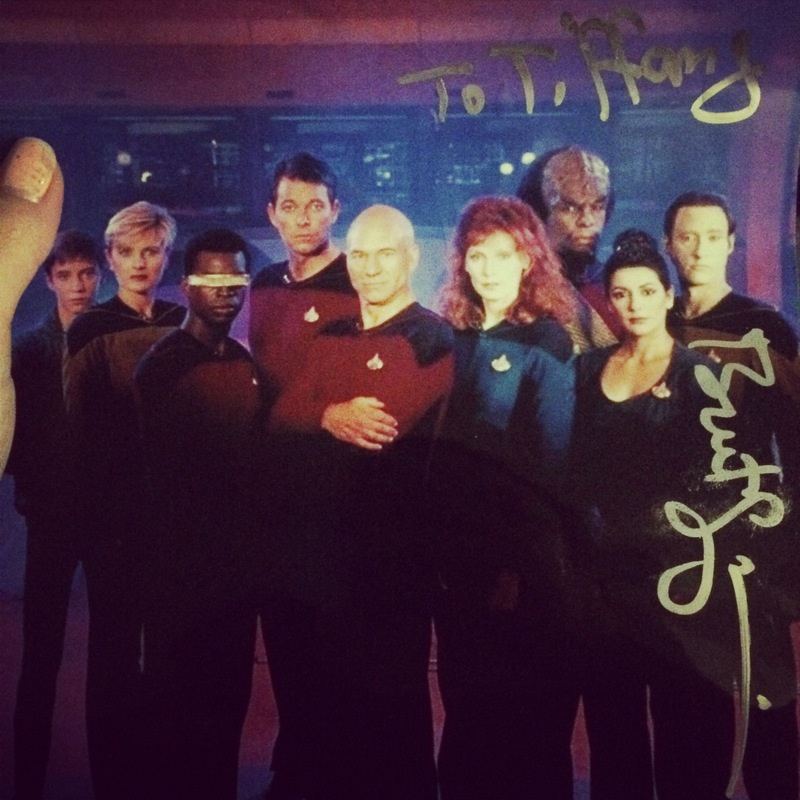 I wanted to go to meet a Star Trek cast member, that’s what I came here for. Mercifully, Brent Spiner aka Data the android blokey was selling himself for a reasonable $40 a squiggle. My eyes still twitched slightly as I handed over the cash, and I looked down into his cold dead eyes. I nervously asked him to make it out to Maddox, and he bantered with me, mocking my British accent as I laughed all weirdly and got flustered under my robes. He used a silver pen rather than the Sharpie sitting next to it, and I’d like to believe it’s because we had a connection. The day ended with us going to a Stark Trek panel, hosted by The Shat. He was red faced, sweaty and clearly hammered. He kept lunging forward and gripping his clammy fists around the table mic like he was Springsteen. The cast looked bored as they trotted out the same anecdotes they’re forced to do again and again and Brent Spiner did some pretend acting about being annoyed. Someone asked Levar Burton about Reading Rainbow and he was all guarded, and now we know why. (Hint: Cos this is why) The panel lasted exactly one hour, and then it was done. As we were leaving we heard a ruckus down below. Lots of whooping and applause. We edged towards the noise and peeked over a balcony to find some grown ups dressed as Mario characters doing a choreographed dance routine to inoffensive yet so offensive bubblegum dance music. I turned to the Jedi and came to a realization. “We’re not nerdy enough to understand all this, are we?”. He nodded sagely, “we should leave before they figure out we’re not one of them”… so we held hands and made like bandits outta there, into the sunset and into the real world. Afterwards we went to Five Guys and had burgers and it was nice. Conclusion: Good fun, quite expensive, bit disorganized, needs more stuff going on would go again… probably.